NANOBIOTIX has for the very first time developed a preliminary preclinical proof-of-concept (POC) with the main product NBTXR3 for its latest program in Immuno Oncology (IO). NANOBIOTIX is a late clinical-stage nanomedicine company focusing on the development of unique approaches that will help in the local treatment of cancer. The mechanism of Immuno-oncology takes place by boosting the immune system of a patient in order to detect and attack tumors and thus destroy the cancer. The approach is extremely efficient for those patients whose tumors are capable of provoking a immune system, in other words, tumors that are also known as ‘hot tumors’ that possess an adequate and natural immunogenicity. Tumors are found to be cold for most patients, and because of this the therapeutic approach has very limited response. Increasing immunogenicity at the tumor level will help expanding the number of patients who can respond to IO. According to the nanobiotix approach, this can be achieved by triggering Immunogenic Cell Death (ICD) at the tumor level, thus turning the tumors that are cold into hot tumors. Preliminary in vivo and in vitro preclinical data point out that Nanobiotix’s radioenhancer NBTXR3 could be used to kill tumors and also to improve the radiotherapy’s power to produce intratumoral vaccines for IO and transform cold tumors into hot tumors. NBTXR3, known as a radio-enhancer, uses a physical mode of action to kill the cancer cells present in solid tumors of different types, along with radiotherapy. Nanobiotix, with its main product NBTXR3, is conducting a global clinical development program in six locations across the US, the Asia-Pacific Region, and Europe. The program covers a registration trial in soft tissue sarcoma, Phase I/II trials in liver cancers (liver metastases and HCC), neck and head cancer, prostate cancer, and rectal cancer (in Asia by Nanobiotix’s partner PharmaEngine). Activation of NBTXR3 nanoparticles, carried out by radiation, improves the energy that is deposited in areas where they are administered, thus enhancing the efficacy of radiotherapy and cancer cell death. This technology is built on physics and has the potential to be used over all radiotherapy indications. All preclinical models, i.e in vivo and in vitro have demonstrated a systematic superiority of killing cells, when NBTXR3 is utilized with radiotherapy, in comparison to radiotherapy being used alone. The capability of generating ICD is shown by generating Damage-Associated Molecular Pattern (DAMPs) that include Calreticulin, ATP and HMGB1. Along with other DAMPs, HMGB1 have also proved to be appropriate just like biomarkers that can be moved to the clinical setting. Release of these DAMPs has been validated in varied sensitive or human resistant cancer cell lines (including pancreatic, colorectal, and glioblastoma cancers). NBTXR3 together with radiotherapy has revealed superiority versus radiation alone in DAMP generation. ATP with around 30% and HMGB1 from 25% up to 47% increase. Classical vaccination assays have shown that in vitro generation of ICD can lead to the stimulation of the immune response and supply bases for long term vaccination. 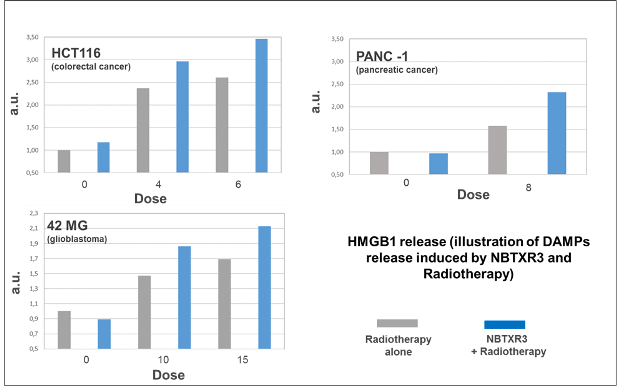 The superiority in blending NBTXR3 with radiotherapy versus radiotherapy alone has been illustrated by vaccination experiment. CT26 cells, also known as murine colorectal cancer cells, were irradiated in the presence and absence of NBTXR3 and then administered subcutaneously (s.c.) into a single flank of the mice (vaccination phase). After a period of one week, living CT26 cells were administered s.c. in the opposite flank of the very same animals (challenge phase). Through the apparition of one tumor (vaccination and/or challenge site), the host immune response against these cells was determined The percentage of tumor free mice containing 6Gy+NBTXR3 is 66%, in comparison to 33% for 6Gy alone and 17% for the control group. This highlights the fact that the integration of NBTXR3 with radiation therapy could lead to an increase in the immune response against tumor cells when compared to irradiation alone. Radiotherapy is a standard of care in oncology. Today it is also being widely explored for its potential to transform ‘cold’ tumors into ‘hot’ tumors, which could lead to expand the number of patients eligible to Immuno Oncology across oncology. Increasing volumes of clinical and preclinical evidence are highlighting the fact that radiotherapy is capable of playing a major role in Immuno oncology, especially when combined. In comparison to biologics or chemo, radiotherapy (RTx) can be used in a number of clinical situations in oncology. However, radiotherapy is considered to be the only treatment that has been well established as a standard of care and also has no or limited systemic toxicity. A novel medical and competitive advantage can be offered to many IO drugs by increasing the ICD induced by radiotherapy at the tumor level across oncology. The core business of Nanobiotix continues to concentrate on the development of NBTXR3, which is intended to be used as a single agent along with radiotherapy. Vital clinical data is expected to be delivered by the program in a number of indications for the upcoming months and years. The very first market approval in Europe is scheduled for the end of 2016. Nanobiotix plans to strengthen its R&D effort in Immuno Oncology as a result of this extra potential on this new field. The company also plans to explore the possible synergies with the existing enhanced approaches in fields such as Vaccines, Oncolytic viruses, Adoptive T-cell therapy, Immune checkpoint targeted mabs or drugs, etc.